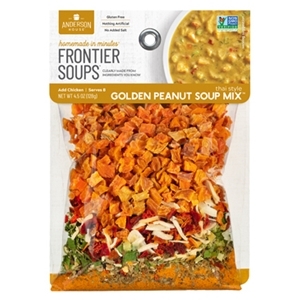 Frontier San Francisco Thai Golden Peanut Soup ia a rich, Thai inspired peanut soup, often served as an appetizer. Just add peanut butter and broth. For a party, garnish each serving with a sprinkle of roasted peanuts and fresh cilantro. Bring broth to a boil in a 2 or 3 quart saucepan. Add dried soup mix ingredients, reduce heat and simmer, covered, 15 minutes. Stir in peanut butter until thoroughly blended. Add chicken if desired and continue cooking on low for 10 minutes. Turn off heat, let stand for five minutes, stir and serve. The historical inspiration for peanut soup reveals the creative combination of indigenous ingredients and regional Southern cooking. Sweet potatoes blended with peanut butter gives this soup its rich, creamy texture. Spicy Moroccan African seasonings add to the intriguing taste. For an intense sauce on grilled chicken use only half the amount of broth and double the peanut butter in above recipe. Serve chicken fingers on skewers with peanut sauce for dipping as a high style appetizer and feed a crowd. May be served chilled. Prepare soup according to cooking instructions. Cool completely on stovetop. Refrigerate for 2 hours or overnight. Add 1/2 cup additional broth or cream to thin consistency of soup. Garnish with a spoonful of peanuts or fresh basil! Simple and delicious! The flavors of this Thai-inspired shrimp and rice dish are perfectly complemented by a rich peanut sauce. Great as an appetizer, too! 2 lbs. raw shrimp, medium 31/40 pieces per lb. Place 8-10 shrimp on a plate with rice. Spoon peanut sauce over shrimp and enjoy! *This soup mix packet makes plenty of sauce to serve 10-12. Remaining sauce can be frozen. Sweet potatoes, red peppers, celery, sliced onions, green onions, peanut flour, herbs and spices; Gluten-free. Allergen Information: Contains peanut flour. I made the soup as directed. One of the most bland, unflavorful soups I've ever had. I added hot sauce and a thai salsa but ended up throwing it out. Waste of time and money. I used natural, high quality peanut butter and received a really creamy texture that was perfect!